The #1-selling cutlery brand in America, Farberware represents high-quality, classic styling, and affordability in cutlery and kitchen products you can trust. Farberware's broad range of cutlery and knife block sets have been thoughtfully designed to meet the unique needs of every kitchen.Farberware blades are durable and long-lasting thanks to tough steel, ceramic and resin materials that resist dulling, rusting, and chipping. Each blade is complemented with an ergonomically designed handle that takes the knife's overall weight and shape into account--making kitchen tasks safer and more comfortable. Every Farberware knife set includes multiple blade shapes and lengths for flexible functionality that makes it easy for you to slice, chop, and cut your way to a delicious meal. Farberware's broad selection of cutlery sets make it easy to outfit or upgrade any kitchen. 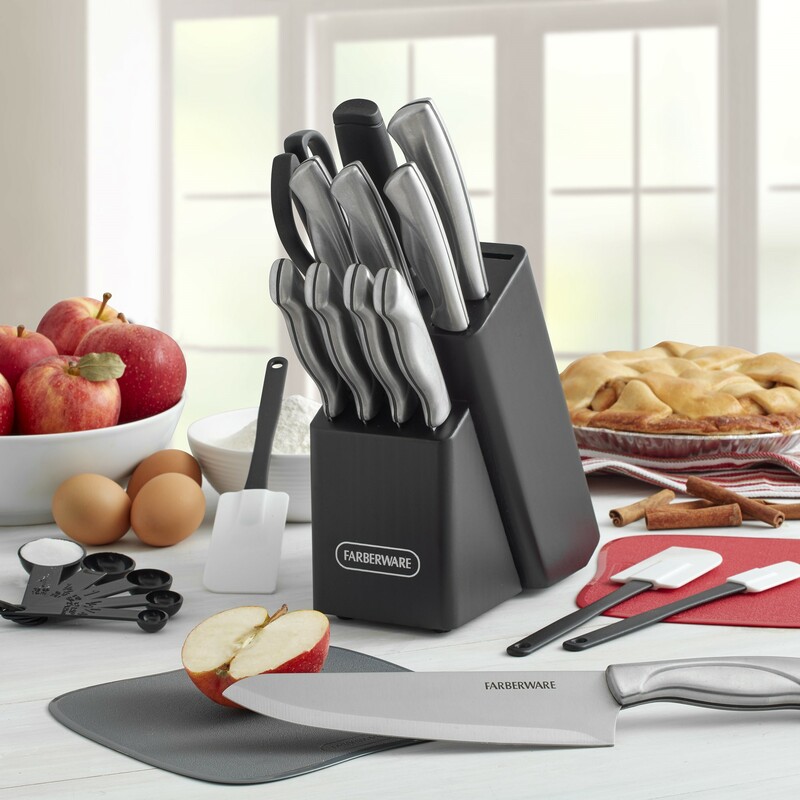 Complete cutlery sets include a wide range of blade shapes and gadgets to tackle a variety of tasks, while the smaller 3- and 6-piece sets make quick work of specialized food prep chores.Farberware cutlery is designed with high-quality materials and special features to ensure a long life, a sharp, durable edge, and flexible functionality. Stainless steel knives are crafted from a tough, rust-resistant alloy. Ultra-durable, high-carbon steel sets are also available. Farberware resin blades feature a specialized coating that keeps food from sticking to the knife. Ceramic blades are made from zirconium, a material that is 10 times harder than steel and can hold an incredibly sharp razor edge. Each Farberware knife set includes an assortment of blade shapes and sizes to provide you with the right tool for the job. Boning knives and cleavers make it easy to break down large cuts of meat, while bread knives glide through crusty loaves for perfect slices. Santoku and paring knives chop, slice and dice vegetables with ease. Some Farberware sets even include sharpeners, cutting boards, kitchen shears, and more. Founded over 100 years ago, Farberware has always stood for value, quality and durability. It's no wonder that they are the best-selling cutlery brand in America today.From knives and cutting boards to pantryware and gadgets, each item in the Farberware family of products is designed with you in mind and is built to the highest standards. Stainless steel, high-carbon steel, and resin products are not dishwasher safe. Hand wash using a mild detergent; rinse and dry immediately. I like the knives, they are strong and sharp. Dislike the cutting board, did not read how small it is. The cutting is like the size of a mouse pad. Tbook.com crawls the web to find the best prices and availability on zz and related Kitchen Items products like Farberware 22-Piece Stainless Steel Knife Set with Cutting Mats. For this page, related items include products we find that match the following keywords: "Kitchen Knife Set" at our vendor partner Walmart. Farberware 22-Piece Stainless Steel Knife Set with Cutting Mats is one of 5 zz and related products listed in the Kitchen Items section of Tbook.com If you have any questions on this product, please give us a call at 734-971-1210 during the hours of 9am - 5pm EST for assistance. Thank you for shopping at Tbook.com, the Internet Department Store!